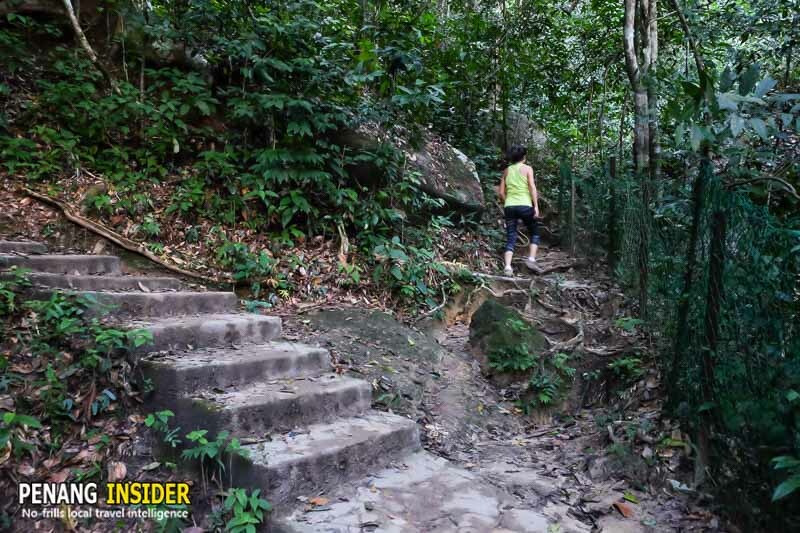 Hiking in Penang Hill at Moon Gate is a popular trek, but did you know that you can avoid the gruelling staircase, and strike off on a hidden jungle route? Read on for all the details. 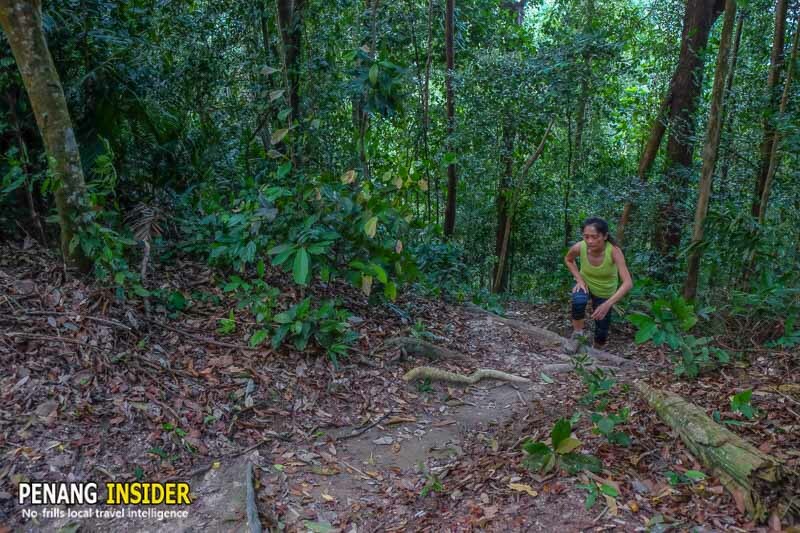 If you are wondering what to do in Penang Hill, remember that it has plenty of hiking opportunities. 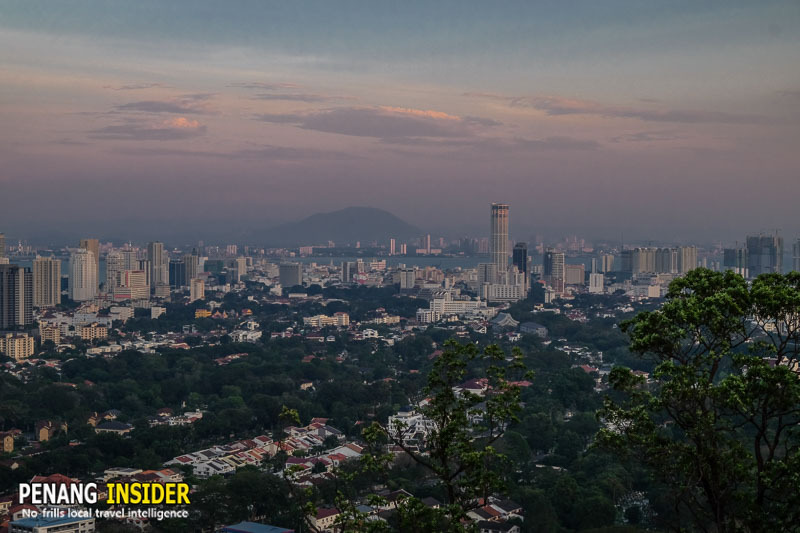 We love hiking in Penang Hill: we have already described how to strike off on one of its secret hiking trails, or why you should visit the Habitat Penang Hill and its interesting zipline Flight of the Colugo. 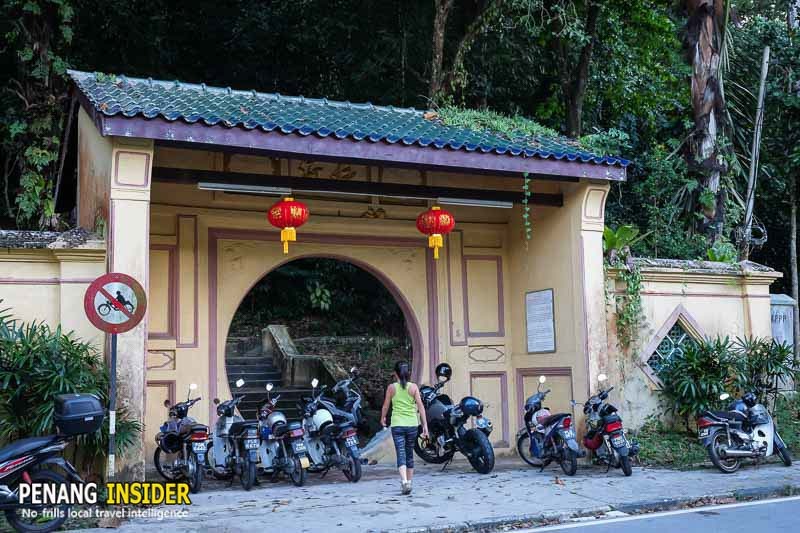 The trek starting from Moon Gate (once the entrance to the home of millionaire Cheah Chen Eok) is certainly better known, but it remains one of the most pleasant and accessible Penang Hill Hikes. Moon Gate is situated along the road to the Botanical Gardens, on the left side of the road, and about 200mt before the gardens’ main parking lot. The trekking route up to Station 5, however, uses a steep staircase which is really not ideal for the knees and for the views. Are you really forced to climb up all those stairs? 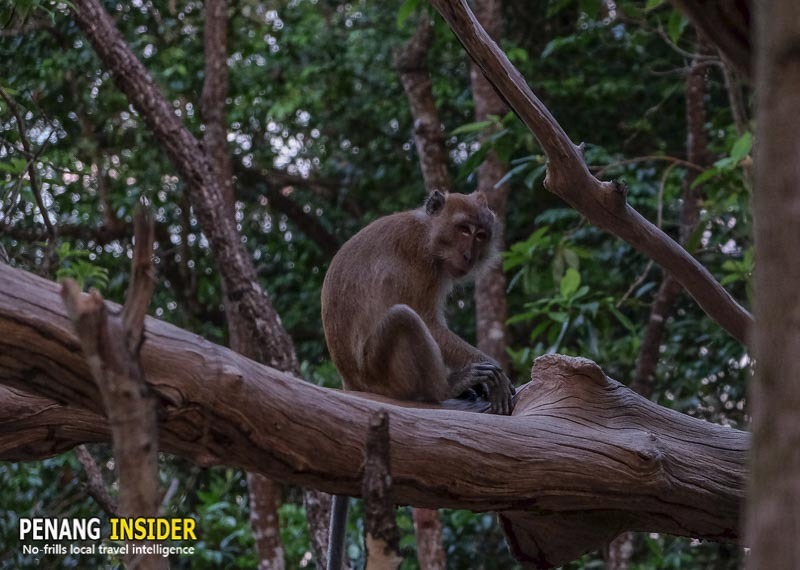 Well, in fact no: there are at least two alternative trails that cut through the rainforest, are much more rewarding ways to hike to Station 5, and give you more chances to see some of Penang’s wildlife — macaques, the cute dusky leaf monkeys, and even some flying lemurs, if you are lucky. In this post, we are going to suggest you our favourite way to make your hiking trip to Station 5 at Moon Gate a most rewarding one. Be advised though, that this is not for weak-knees, unfit people or smokers. For sure you’ll have to earn your way up and work up a bit of sweat. You can drive to the parking lot at Youth Park or directly to the Botanical Gardens and walk back to Moon Gate entry, or you can catch a Grab here from George Town. Rapid Penang Bus #10 goes to the Botanical Gardens and pass by Moon Gate as well. To start, go to Moon Gate and walk up the staircase beyond the arch. Turn to the left and proceed up the forest path that immediately curls to the right, and then continue walking up until you hit another bend to the left. The trek here is still quite interesting, without those small, steep staircase steps that frankly ruin it for everyone. 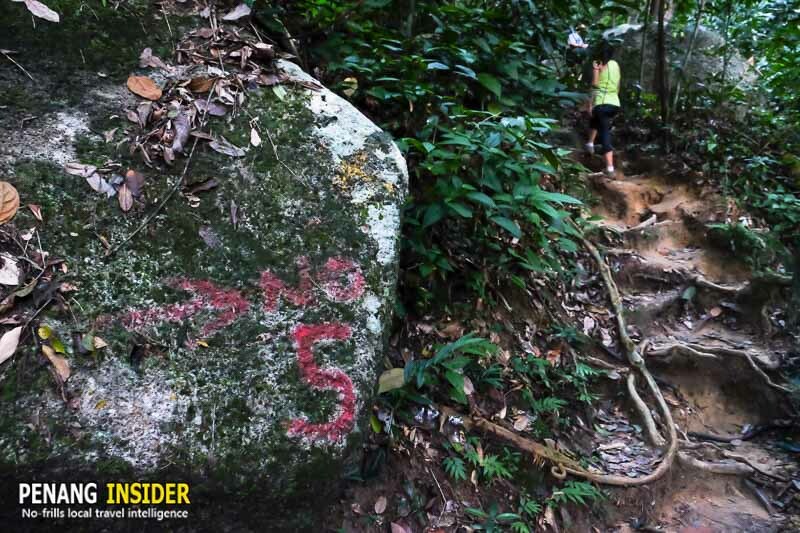 In order to start hiking up the correct alternative path to Station 5, at the bend described above, you will have to continue straight into the forest, instead of taking the left-hand path which ultimately turns into a nightmare of steps. Look for the point where you can see a big rock set to the left of a small side path which continues straight into the jungle along a green metallic fence. Here’s where the adventure starts: see the picture below for details. Don’t worry, as you can’t get lost: there are several red “Number 5” signs spray-painted on rocks and tree trunks along this side route. You should be able to see the first one exactly here on the rock to your left. Once you have left the main path, continue upwards, where a very adventurous and steep climb welcomes you into Penang Hill’s real jungle. 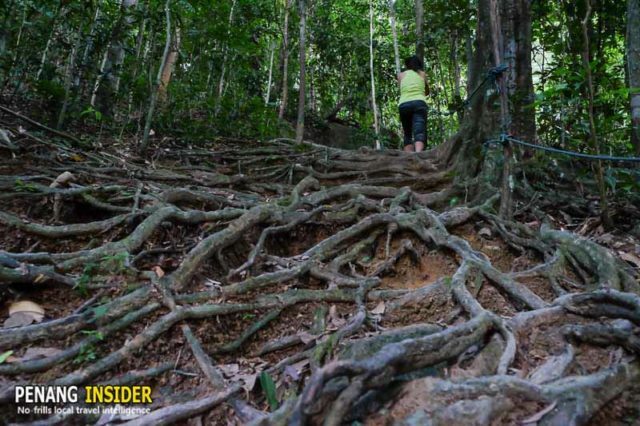 You will climb over tree roots and rocks, and you may help you up with the rope that is installed on the right hand of this new path until you’ll get to a point where it levels out straight, and your hike becomes a smoother affair. 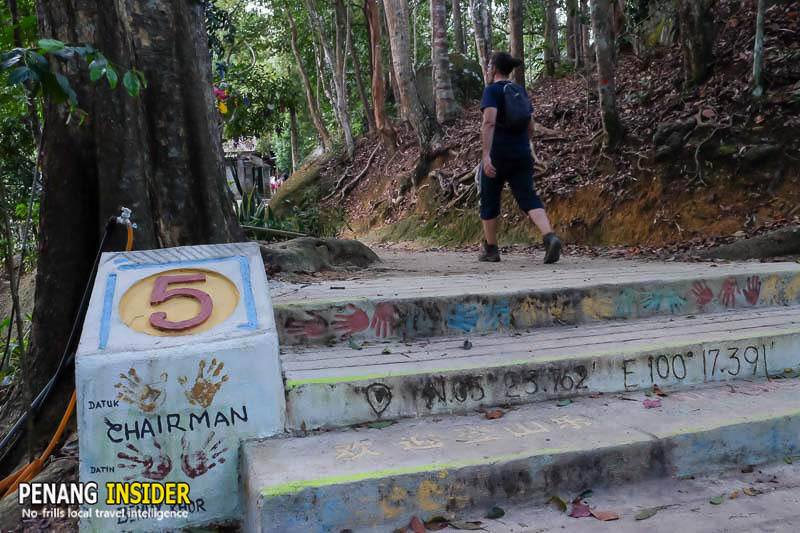 Hiking to Penang Hill Station 5: here’s where the fun starts. Not for armchair travellers, for sure (image by Marco Ferrarese). Continue trekking and following the path. 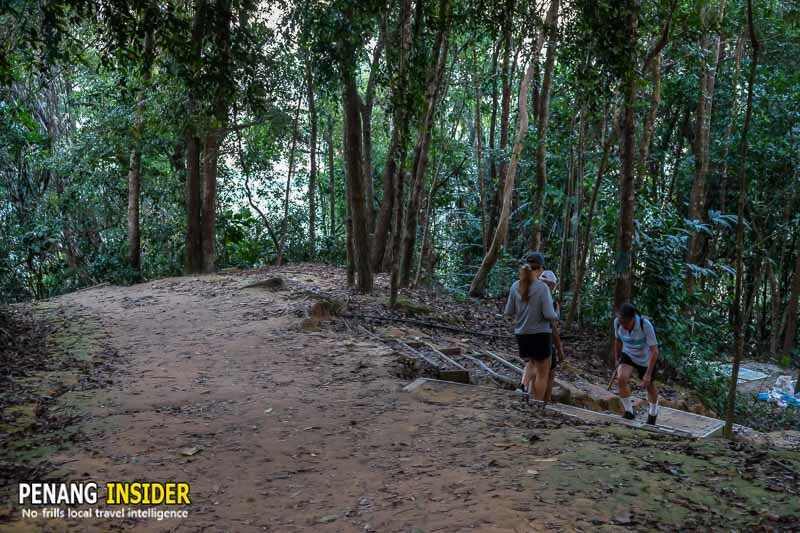 From this moment onwards, you will be able to walk pretty much on plain ground, making your way around the side of Penang Hill, and only occasionally going up an down over rocks and trees. The path is clearly marked and supported by ropes wherever necessary, so no worries as you won’t lose your way. In those cases where you may be confused, always look for and follow the red “Number 5” marks. You will know that you have roughly reached the mid-point of this trek once you’ll climb upwards one-umpteenth time, to find a section of the path paved with concrete tiles. Follow it: after descending along the side of the hill, you’ll come to face a huge boulder soaring on the right side of the path. It’s a good place to stop and observe the surrounding nature: bats live in the hollow between the base of the rock and the forest’s floor, and occasionally swarm out, making for an interesting site. Be prepared because, after the boulder, you are in for the toughest climb of the trek. You will reach a fork in the road where the steep side of Penang Hill joins with the track you are on. If you continue straight, you will make your hike a bit longer and not significantly easier, ending up at the back of Station 5. 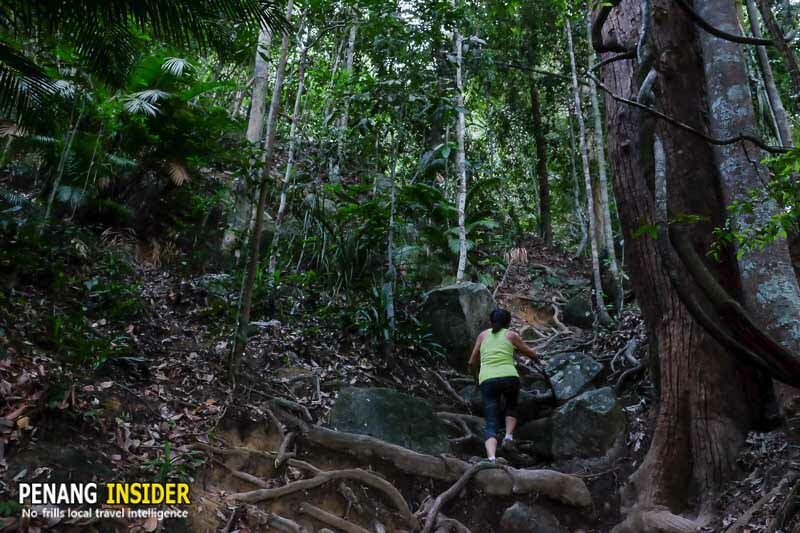 We suggest you turn left and follow the track as it snakes upwards along the flanks of Penang Hill. It’s a tough climb over roots, vines and mud steps carved into the path. There are some ropes to help you up — but no matter your level of fitness, this is the one part you will remember. The upper limit of this hillside connects with the wide earthen road joining Moon Gate’s staircase to the left, and Station 5 to the right. Moon Gate Station 5 is where you want to stop after all this sweaty hiking. Why? Great views, comfort, and some exercise. Over the years, a group of frequent hikers have turned this place into a real fancy rest stop, and to us, Station 5 is one of the best places to visit on Penang Hill. The area nestles gently over the hill, which has been landscaped and turned into a three-levelled rest and exercise area. As you come in, on the lower right, there’s a space filled with exercise machines; just up a couple of steps is the main rest area, where you can find a rock table with pots filled with warm water, Chinese tea, and even some delicious coffee and biscuits, all prepared by hikers for other hikers, and available free of charge. Consider it as a nice treat after a good sweaty climb. On the left side is a terrace with chairs where you can relax and have some views of Penang from the canopy. At the back are a few fitness machines, which have seen better days, but are good enough for some serious weight lifting and exercise. Take all the time you need here — but remember that it’s quite hazardous to stay well after 7 pm, as otherwise, you’ll end up hiking down in the dark. The forest is a very dark place to be, even around 7.15 pm, so exercise caution and watch the time. Backtracking from Moon Gate Station 5 after some due rest and relaxation, you’ll return to the road you have reached at the end of your trek. If you proceed straight, you will find two ways down: straight ahead is the staircase that brings you all the way down to the main arch at Moon Gate. But as we don’t suggest you take this route up, we think you also shouldn’t use it to hike down. Look on your right, and you’ll find another path, and another set of steps, just a few meters before the other. This is the way we suggest you use to descend from Station 5. Remember that, if taking this route, you will pass by Station 3 — similarly interesting and well-landscaped, but not nearly as well-manned and organized as Moon Gate Station 5 — and you will not return at Moon Gate, but at the basketball court in Youth Park. Don’t fear as it’s just 5 minutes walk from Moon Gate. INSIDER TIP – Park your car at Youth Park’s parking lot, one minute walk away from the end of this trail. You can walk to Moon Gate, hike up, and then find your vehicle exactly where you’ll descend after your Penang Hill Hike to Station 5. There are two main landmarks when coming down this route: Station 3, the first one, which also has toilets may you need one. The second is right below Station 3, after the road curls down to the right, and opens up over a very scenic view of Penang’s northern coast extending all the way to Bukit Mertajam to the east, and Gunung Jerai in Kedah to the west. Depending on the time of the day and the visibility, you’ll have some great picture opportunities here. Try to arrive around 7.15 pm, right before sunset, when the sky turns pink over George Town and the Straits of Melaka, casting long shadows and glittering light all over George Town. From this point, it’s roughly another 15 minutes hike down along a very well-marked path to Youth Park. If you pay attention to the right-hand side of the track you’ll find a couple staircases: these are shortcuts to descend quicker and cut some of the bends. It’s really up to you, your timing, and your level of tiredness. As one last pointer, remember that after the shortcuts, you’ll arrive at a pretty steep slant in the path that cuts through dense forest. This is right before you’ll see a concrete house set next to a small bridge on the left. Continue walking over this bridge, and in less than a minute the forest will open up again, and you’ll have arrived at Youth Park. The basketball court is straight below you, next to the main paved road. Walk down and to the left, and you’ll see the parking lot, your vehicle (if you have followed our parking suggestion), and the main Waterfall Temple Road to the Botanical Gardens. If you turn right, you’ll arrive at the traffic light and crossroads in front of the Waterfall Hotel, with Jalan Gottlieb to your left. We hope you enjoyed your Penang Hill hike at Moon Gate Station 5! And if by now you are hungry and need a big fat dinner, check out these 26 Great Penang Foods, and 80 best places where to find them.